Featuring an alternative cutting method and clever auto-levelling system, Mzuri has taken a fresh approach to hedgecutter design and created its own machine. James Rickard puts a pre-production model through its paces. Designed to make operation simpler with less maintenance, this is the new hedgecutter concept from Mzuri. Famous for its range of strip-till drills, Mzuri has now branched out into the world of hedgecutters. Said to take hedgecutter design to the next level, the new Mzuri-designed and built Razorback features two clever innovations. 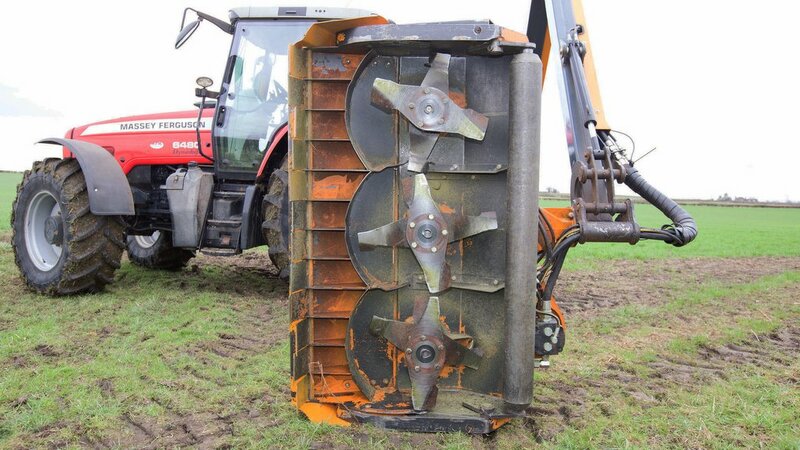 The first is an automatic levelling system which compensates for any sideways roll of the tractor, and the second is a head which uses three sets of rotary blades designed to cope with a wider variety of materials and thicknesses. No stranger at producing hedgecutters, Mzuri’s founder was also the founder of hedgecutter manufacturer Spearhead. He says; “Even after selling Spearhead to the Alamo Group I still had plenty of ideas about hedgecutters. 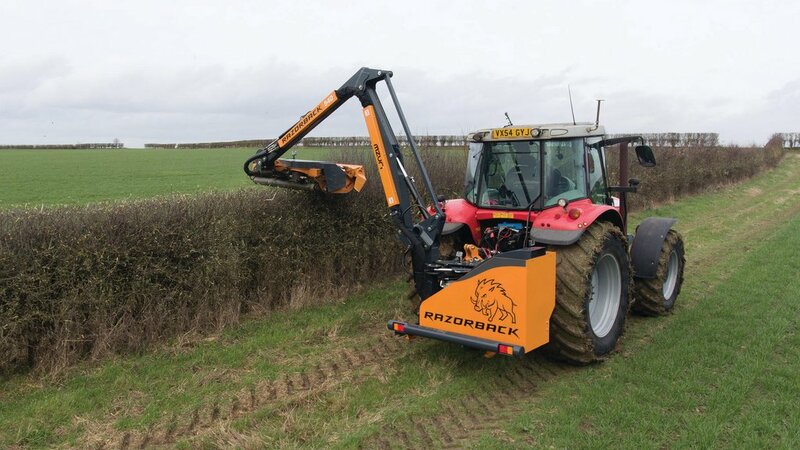 “The Holy Grail of hedgecutters has always been a cutting head which stays level, even when the tractor is rocking and rolling from side to side. So has Mzuri achieved it? To see what the Razorback is capable of ahead of its official launch at this week’s Cereals Event, we headed to the fields of Worcestershire with a pre-production machine. 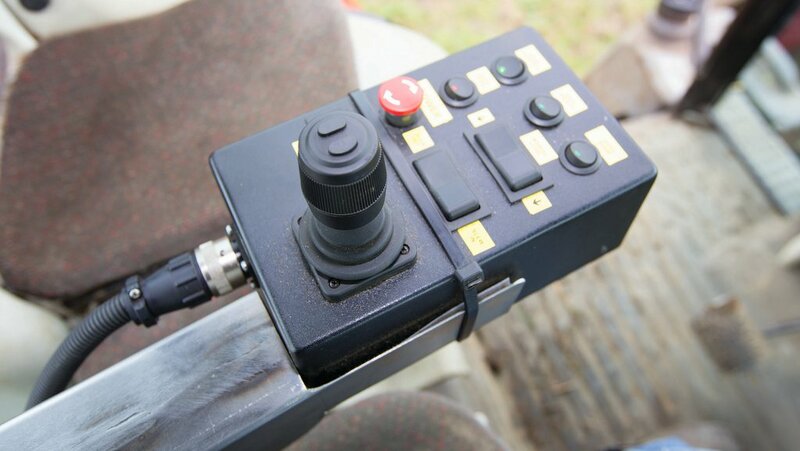 Called Co-pilot, the automatic levelling system on the Razorback works by using an on-board gyroscope to determine the sideways roll angle of the tractor, and hydraulics to compensate for the roll. Mechanically, this sees the main body of the hedgecutter sat in a frame which is attached to the tractor. The hedgecutter is fixed to the carrying frame via a pivot point allowing it to be hydraulically tilted from left to right. In reality, this allows you to drive on an uneven surface, with the cutting head staying consistently level. At first, it is quite a strange sensation letting the machine do some of the work for you; a bit like the first time using auto-steer. After a while you do get used to it, putting less input into the controls. 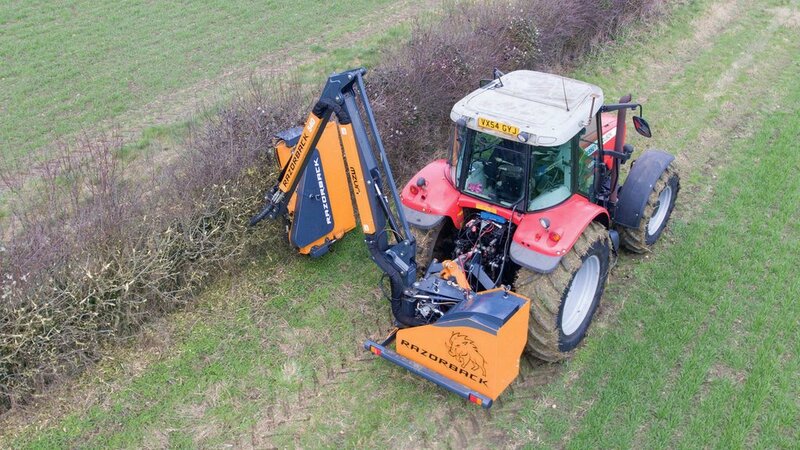 For the more experienced hedgecutter operator, the system will essentially act as a driver aid, making a long working day more comfortable. For the more novice drivers it will make them look good. While using gyroscopes in an application like this may sound overly complicated, gyros are nothing new and can be found in everyday devices such as mobile phones and sat-navs. The auto-level system can be turned off and/or controlled manually if desired. Production machines will also offer the ability to alter reaction time of the system. 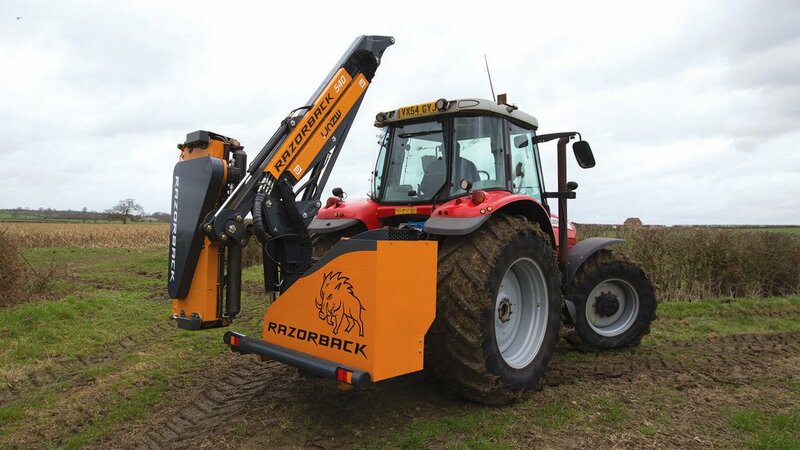 The Razorback is three point linkage mounted to the tractor, held in place via a fixed linkage to the top link and supported by another link to the tractor’s drawbar. Un-hitching is fairly simple, with pins removed from the fixed linkages, allowing the machine to be lowered onto its stand. 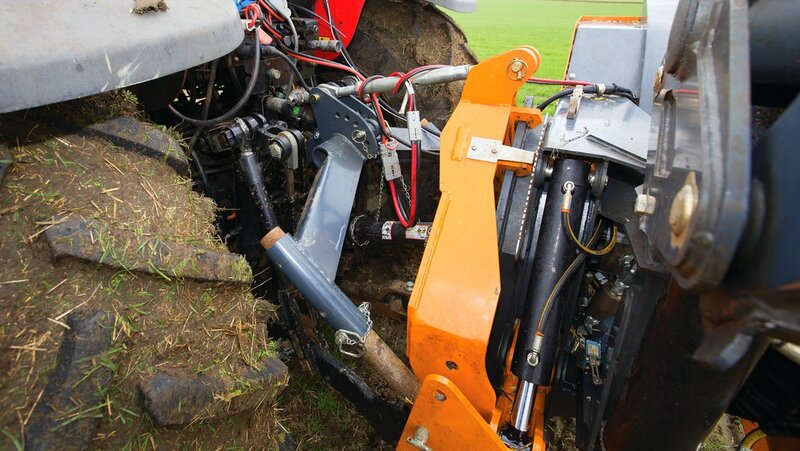 There is also quite a decent amount of space to get to the tractor’s linkage when hooked up. For the foreseeable future, only a 5.5m-reach model will be available. This is the volume seller according to Mr Lole, although Mzuri may offer a telescoping version, but probably not a forward reach variant. The arm uses a mechanical parallel linkage and offers plenty of articulation – the head alone has 220 degrees of orientation. For transport, it currently slews rearwards by 90 degrees, but production machines will see this increase to 100 degrees, reducing transport width. The auto-levelling system will also only switch on when in working position, and the arm features a break back safety feature. Although a pre-production machine, pipework looked tidy, particularly around the articulation points. At the head-end, pipework is routed through the centre of the articulation, keeping pipe wear down. The head on the Razorback comprises three, 500mm diameter, four-blade rotors, positioned side by side. All spin the same way, driven by a belt which is powered by a motor positioned at the rear of the head. It is a neat layout and avoids having a motor stuck out at the end of the head. At 1.5m wide (five feet), the head is generous. It can cope with a lot of material too, said to be able to manage branches up to 130mm (five inch) in diameter, and the odd tree with enough patience. As a result, it means you can take fewer, more greedy cuts and still leave a decent finish. All of which should, in theory, save time and diesel, and leave less wheel markings in the field. Compared to a flail head which is in contact with the hedge for about 20 per cent of its rotating cycle, the rotary design is in touch with the hedge for 100 per cent of its cycle. Effectively, this sees the rear portion of the rotors provide a polish cut. The amount of inertia in a rotary head also helps keep up rotor speed, again leaving a cleaner cut, unlike a flail head which can often sees its speed rise and fall with the amount of material it has to cope with. Also, there are no flails to get knocked back or off. Even with a variety of hedge thicknesses, the rotors ran consistently smooth throughout our test. Thanks to side deflectors, the head does contain material quite well and keeps it in the hedge. It also does a decent job of mulching thanks to two layers of blades. The front hood is hydraulically adjustable, making it easy to adapt to different stages of growth. It loves grass too, which shows the versatility of the head - no need for different heads for different jobs. Mr Lole reckons a 1.8m head is also possible with a rotary design. From a maintenance point of view, the 40mm rotor shafts use standard-size sealed bearings, and are claimed to never need re-balancing. In addition, only occasional sharpening is required. For our test, we had the pre-production controls. Although a bit rough round the edges, they gave us a good idea of how simple the machine is to operate. A proportional joystick takes care of main arm movements, with buttons to activate rotors and auto-level function, hood and roller raise and lower, and control for manual levelling and slew. All controls are obvious as to what they do and take little time to get used to. Arm and head movements are smooth and responsive, and the high capacity hydraulic pump copes well with multiple actions. While pre-production controls are all together in one box, production machines will see the joystick and the secondary button controls split into two separate units. This will allow the small an unobtrusive joystick to be easily attached to an armrest, while the larger box with buttons can be mounted out of the way, anywhere in the cab. Firstly, it is hard to believe no manufacturer has come up with either of these two innovations before. Whether you are an experienced hedgecutter operator or a relative novice, the auto-levelling function does make operation substantially easier, and should impress your neighbours. At the business end, the new head design means less passes along the hedgerow, and its versatile nature means it can cope with a wide variety of materials and thicknesses. 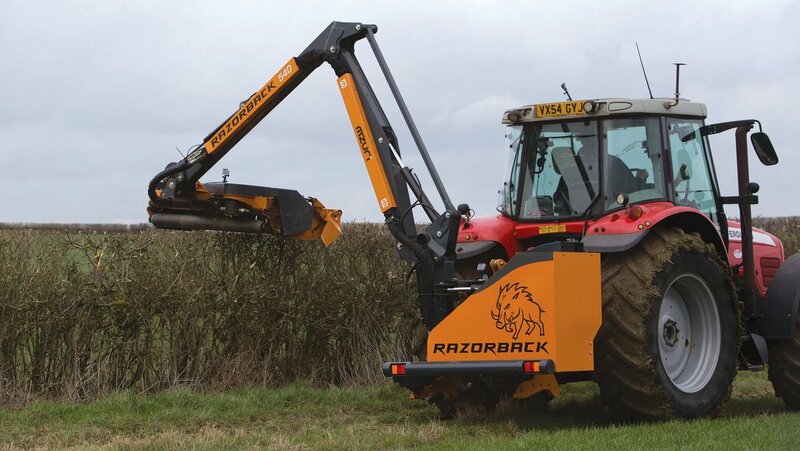 Will the Razorback revolutionise the hedgecutting world? This is yet to be seen, but it should give it a good shake up if nothing else.